"Shake It Up" is a song by the Cars from their 1981 album of the same name. Although appearing for the first time in 1981, it was actually written years earlier by the band's songwriter and lead singer Ric Ocasek. The song became one of the Cars' most popular songs (peaking at No. 2 on the Billboard Top Tracks chart and No. 4 on the Billboard Hot 100 chart in early 1982). 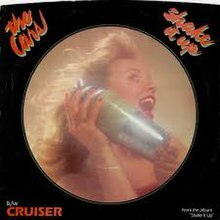 With the track "Cruiser" as its b-side, it hit No. 14 on the Billboard Disco Top 80 chart. The song is primarily reliant on dance-pop as its main genre, with pop rock elements audible. Add to these keyboardist Greg Hawkes' synthesizer lines, the associated instrument of bands labeled "new wave" at the time, and it is a prime example of The Cars' genre blending. Drummer David Robinson said at first he did not even want to record the song, as it was "kicking around for years. It never sounded good. We recorded it a couple of times in the studio and dumped it, and we were going to try it one more time, and I was fighting everybody . . . So we thought, let's start all over again, like we've never even heard it—completely change every part—and we did. Then, when it was through and all put back together, it was like a brand-new song." Guitarist Elliot Easton said he wanted his solo to sound like "two guys trading off". He plays first a Fender Telecaster in a style skewing "country", then midway through the solo switches to a Gibson Crank to sound more rock. The song references dance moves, hair styles and having fun. However, bassist Benjamin Orr has stated the song tells the story of how important it is to make a mark in life, to "let them know what you really mean". Thus, the hit song has an existential element as well as a simple message. Ric Ocasek has since dismissed the song's lyrics, saying, "I’m not proud of the lyrics to 'Shake It Up.'" ^ Whitburn, Joel (2004). Hot Dance/Disco: 1974-2003. Record Research. p. 52. ^ "The Cars | New Music And Songs |". Mtv.com. 2000-10-03. Retrieved 2016-10-23. ^ Spitz, Mark. "Q&A: Ric Ocasek of the Cars". Vanity Fair. Retrieved 9 August 2015. ^ "Dutchcharts.nl – The Cars – Shake It Up" (in Dutch). Single Top 100. Retrieved January 14, 2017. ^ "Charts.nz – The Cars – Shake It Up". Top 40 Singles. Retrieved January 14, 2017. ^ "The Cars Chart History (Hot 100)". Billboard. Retrieved January 14, 2017. ^ "The Cars Chart History (Dance Club Songs)". Billboard. Retrieved January 14, 2017. ^ "The Cars Chart History (Mainstream Rock)". Billboard. Retrieved January 14, 2017. ^ "Australian Chart Book". Austchartbook.com.au. Archived from the original on 2016-03-05. Retrieved 2016-10-23. ^ "Item Display - RPM - Library and Archives Canada". Collectionscanada.gc.ca. Archived from the original on 2016-08-11. Retrieved 2016-10-23. ^ "Top 100 Hits of 1982/Top 100 Songs of 1982". Musicoutfitters.com. Retrieved 2016-10-23. This page was last edited on 4 April 2019, at 03:00 (UTC).